Industrial-progressive unit ‘Black Market Serotonin’ have just released the new video single ‘Irons In The Fire’, taken from their debut album ‘Something From Nothing’ released through Superstar Destroyer Records and all digital stores on Monday 29th April 2013. On Irons In The Fire, Black Market Serotonin deliver their sharpest statement from upcoming full-length Something From Nothing. From an intro that recalls Nine Inch Nails, chorus that could be Origin of Symmetry Muse and wall-of-sound riffage that harks back to the glory days of Tool and Deftones, it's clear that these guys enjoy the heavier things in life. Wrapped in a veil of rich melodies the overall effect is not the blunt instrument you might expect; it's surprisingly accessible, even if it's still music to headbang to. 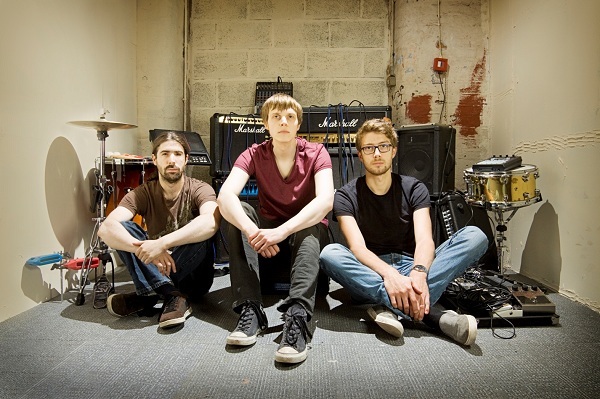 Born in 2010 and hailing from Manchester, Black Market Serotonin feature the talents of Andrew Pimblott (Vocals, Guitars, Keyboards/Samples), Lee Campbell (Bass Guitar), and Michael Colman (Drums/Percussion). The trio met during their University days, and aided by their mutual fondness for thoughtful and progressive rock, they soon became firm friends. After many months of intense rehearsals in Colman's basement fuelled by caffeine, sleep depravation, and a lack of light, the band emerged with their debut EP Deadbyfiveoclock. The record was released in the Spring of 2011 and garnered widespread praise and accolades from many online publications and bloggers. Now with indie label Superstar Destroyer putting out the record, Something From Nothing will be unleashed on the nation this Spring. Firstly, the band release a taste of things to come - the brand new video single Irons In The Fire which is lifted from the album. ‘Irons’ perfectly showcases the band’s deft ability to unleash a concise piece of engaging post-rock with measured synth work and vocal lines, all to stunning effect. Black Market Serotonin have arrived.